If you’re in the market for a full-sized pickup truck, most likely you’ve been spending ample time researching all of the makes and models on the market. With so many pickup trucks to choose from, it’s imperative that you do your research since not all trucks are created even close to equal. No, when it comes to full-sized pickup trucks, some models just can’t compete. Take the 2017 Chevy Silverado 1500 vs. 2017 Toyota Tundra – the Silverado outshines the Tundra in nearly every metric. If the subpar performance and lackluster interior of the Tundra hasn’t convinced you to choose a Silverado, then let the safety score tip you over to the Chevy side. The 2017 Chevy Silverado boasts a five-star overall rating from the National Highway Traffic Safety Administration and a best-possible score of Good from the Insurance Institute for Highway Safety in all categories, except the small overlap front test. The 2017 Toyota Tundra has a four-star overall crash test rating from the NHTSA and, although it also was rated “Good” by the IIHS, it had weak scores in the small overlap and roof strength tests. So while the 2017 Toyota Tundra certainly isn’t an unsafe car, the 2017 Chevy Silverado is just that little bit better – which is pretty much true of every metric we could measure. The 2017 Toyota Tundra just can’t compete with the 2017 Chevy Silverado, especially when you consider the Tundra is the more expensive truck. The 2017 Toyota Tundra is unique in that every model comes standard with a V8 engine, as opposed to the Silverado, which comes standard with a V6 (although a V8 engine is optional). The Tundra’s 4.6-liter V8 generates 310 horsepower, although you can upgrade to the 5.7-liter V8 if you want your horsepower closer to 380. The Silverado’s standard V6 puts out 285 horsepower, but if you opt for the 5.3-liter V8 you’ll get 355 horses or 420 horses if you go for the 6.2-liter V8. So you’re probably looking at this thinking: doesn’t the fact that the Tundra comes standard with a V8 make it a superior truck? Well, no. And there are a few reasons for that. 15 miles to the gallon in the city and 19 mpg on the highway. Compare this to the 2017 Chevy Silverado’s 18 miles per gallon in the city and 24 on the highway, and you’ll start to notice a pretty substantial difference when it comes to filling up the pickups. And if you decide to opt for the V8 engines? You’ll still be coming out ahead in the Silverado, as the 5.3-liter V8 gets 16 miles per gallon in the city and 23 on the highway, while the 6.2-liter V8 gets 15 mpg in the city and 21 mpg on the highway. Here’s the other issue with the Tundra and its V8 engine – if you’re using it for commuting or just driving around, you’ll be fine, but when it comes to really using the pickup for heavy lifting or towing, you’re going to need some more oomph – which you’ll find in a Silverado. The 2017 Toyota Tundra will max out its towing capacity at 10,500 pounds, while a properly equipped Silverado is going to max out at 12,500 pounds. Even a base-model Silverado pulls 9,800 pounds, so if you’re looking to save at the pump and don’t need the truck for extreme heavy towing, then your best bet is still the Silverado. What about payload? If you’re looking to fill your truck bed and haul heavy things around, then once again, the Silverado smacks down the Tundra with its max payload of 2,250 pounds versus the Tundra’s 2,080 pounds. Sure, it may only be 170 pounds more, but when it comes to dollars for value, the Silverado is going to give you the best bang for your buck. The last thing to note for performance is this: despite the fact the 2017 Toyota Tundra puts up lower numbers across the board than the 2017 Chevy Silverado, Chevy comes up lower where it matters: your wallet. A 2017 Chevy Silverado has a starting MSRP of $27,785 while the 2017 Toyota Tundra starts at $30,120. Add your increased fuel costs to the price of the Tundra, and the Silverado starts looking even better. It’s a clear winner when it comes to pick-up performance: the 2017 Chevy Silverado beats the 2017 Toyota Tundra, hands down. You’re probably assuming that while the 2017 Toyota Tundra couldn’t match the 2017 Chevy Silverado in performance, it’s a more expensive truck because it offers a nicer interior. Unfortunately, you’re wrong. Both the Tundra and the Silverado come in three different cab styles and several unique configurations – like most trucks on the market, they both lend themselves to customization. The Tundra offers six trim levels – the SR, SR5, TRD Pro, Limited, Platinum, and 1974 Edition, while the Chevy offers five – WT, LS, LT, LTZ, and High Country. Opting for the base model trim – the SR – in the 2017 Toyota Tundra is going to equip your truck with heated power mirrors, keyless entry, air-conditioning, cloth upholstery, a rearview camera, Bluetooth phone and audio capability, full power accessories, a 6.1-inch touchscreen interface, a six-speaker sound system, a USB port, and an auxiliary jack. The base model Silverado – the WT – comes with air conditioning, a 4.2-inch color audio display, a USB port, an auxiliary jack, cruise control and power door locks. 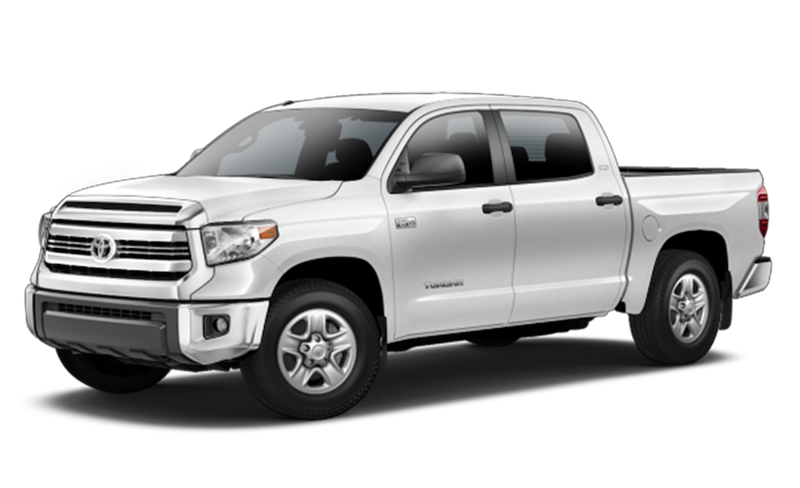 It’s important to note that the Tundra in its Work Truck package (which is more comparable to the Silverado WT trim) removes the power locks and windows and replaces the cloth upholstery with vinyl, giving the truck a closer resemblance to the Silverado. Again, you’re probably thinking – so I was right, the Tundra offers a nicer base model pickup. And while you aren’t exactly incorrect, that’s not entirely accurate either. The Chevy base model is essentially its work truck, so of course it’s not exactly luxurious. Additionally, it is cheaper than the Tundra’s base SR. To make a more fair comparison, we need to look at the 2017 Toyota Tundra SR, which starts at $30,120 and compare it to a Silverado’s higher level, non-work-styled trim, which is the LS trim. Get the LS trim in your 2017 Silverado and your truck is coming with: power and heated mirrors and windows, remote locking, deep tinted glass, a 7-inch touchscreen, Apple CarPlay, Android Auto, a six-speaker sound system, voice control, 4G LTE and WiFi connectivity, chrome bumpers, a chrome grille, and stainless steel finished wheels. The price for all of that? $29,810 – still cheaper than the Toyota Tundra. 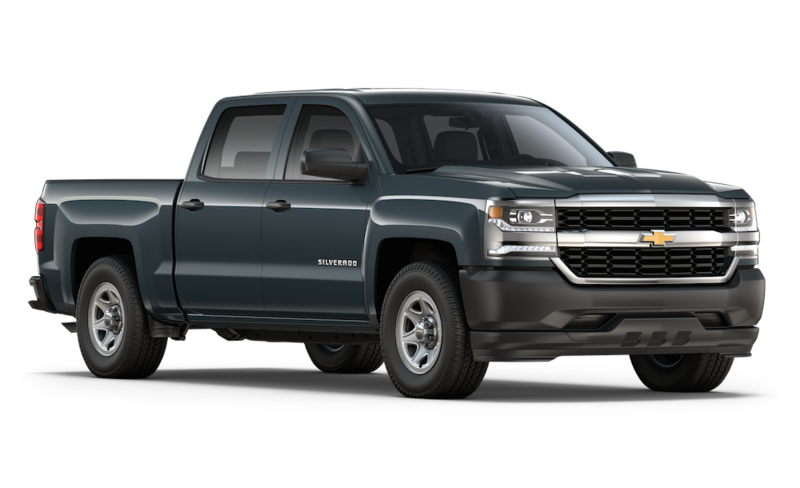 Not only does the Silverado offer better features than the Tundra for a lower price point, it offers a quieter, smoother, and more comfortable ride than the Tundra, and it also provides more bed sizes per trim level than the Tundra. If you’re looking for a pickup with an interior you’re actually going to want to commute in, then you need to bypass the Tundra and start looking at the Silverado. When you go to buy your new full-size pickup truck, don’t compromise on performance, amenities or safety. Just go Silverado.